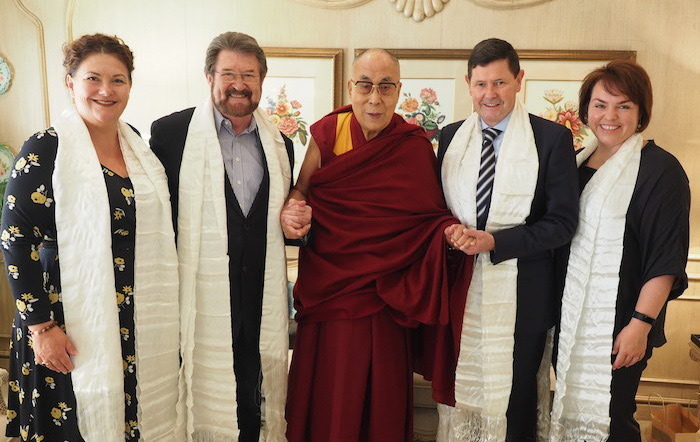 (TibetanReview.net, Nov22, 2017) – A delegation of members of the Australian parliament is on a four-day visit to Dharamshala to meet with Central Tibetan Administration officials and institutions and others over Nov 20-23. On their way to Dharamshala, the delegation met with the Dalai Lama at the Taj Mahal Hotel, Mansingh Road in New Delhi on Nov 20 morning. The Central Tibetan Administration’s Tibet.net said Nov 20 that the Dalai Lama spoke to the delegation about issues of global concern such as promoting dialogue for resolving conflicts and environmental issues. He was also stated to have spoken about his devolution of powers to an elected exiled Tibetan leadership in a final push for its full democratization. The delegation was stated to be scheduled to meet with President Lobsang Sangay of the Central Tibetan Administration, visit various Tibetan Institutions, meet with Tibetans and to hold a press briefing on Nov 23 morning. The delegation is made up of its leader Senator Derryn Hinch from the Justice Party of Australia, Deputy leader Kevin Andrews who is a former Defence Minister and belongs to the Liberal Party, Senator Kimberly Kitching from the Labor Party of Australia, and Meryl Jane Swanson who is also from the Labor Party of Australia. The delegation is accompanied by Representative Lhakpa Tshoko of the Office of Tibet, Canberra.